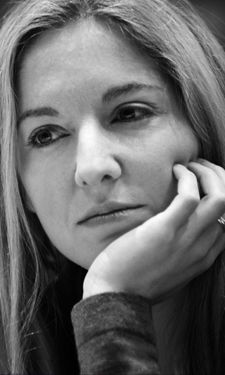 Victoria Coren Mitchell - Blog - Wow! That’s big! The first night, awkwardly enough, it got a laugh. It isn’t supposed to get a laugh. Mother Courage is supposed to be a piece of harrowing German tragedy. Still, what could I do? The second night, I played it for laughs. I never got cast in a school play again. Clutching the script in my trembling hand, I was 16 again, in front of that giggling crowd of my peers. I think my lower lip might have started to tremble. I am a nightmare for makeup ladies the world over - one of my many curious tomboy qualities is that I HATE having my makeup done, I don’t like having my face touched, particularly not my eyes and ugh ugh not my hair, I don’t like the feeling of wearing makeup, I find it most peculiar to have a multicoloured face, and I get impatient in the chair, squirming around and wriggling to get away. It’s like trying to give a cat a bath. So, possibly anticipating a meltdown of my eye makeup and an hour’s further torture for the poor woman who’d put it on in the first place, the nice director allowed me to change my line to “How much? Wow!” A bit ditsy, but definitely the kind of thing I’d say. Walking back past the makeup room, I saw the excellent Barry Greenstein, multiple tournament-winner, lavish charity-giver, poker guru, wise man, father, writer, broadcaster. I was feeling a little guilty at having been difficult so I told Barry the story, knowing he would sympathize with the situation I’d been hoping to avoid. Barry Greenstein is aware of the mischief that happens on those poker forums and, being a proper grown-up man, he would have no time for such nonsense. Then he winked, giggled and carried on clipping his beard. OK, I’m a man. There’s way too much emotional info going on in that for me to take it all in. And that “marvellous” at the end - is that marvellous as in “resigned sigh” at the predictability of man or marvellous as in “he saw the funny side of it too”. See - it’s difficult for a man to follow these intricacies. Anyway I remember a play from my teenage years when the ugliest girl in the sixth form had to receive a compliment about her beauty in a play by Wilde I think. I remember being rather in awe of her courage as she accepted each night the guffaws that accompanied this little scene with such good grace - almost regal good grace as I recall. Yes, that’s real courage isn’t it? You obviously did the right thing. Those amazingly talented perv-geeks at 2+2 would have had a field day with that one. Today I took my very first coaching session of a group of young footballers in an affluent area of Manchester, all aged 11 years old. I find that privileged children can be quite self-assured, maybe I’d go so far as to say cocky, and I look about 11 years old myself so establishing authority was of prime importance. After a brief warm-up I was teaching them heading skills, my first ever ever drill as a proper coach! I said ‘Ok, get your balls in your hands’. Respect lost. Potential career as a coach cut short. Gin. Sleeping pills. When the order starts to change, you know you’re in trouble! Bad advert scriptwriter! People (and especially men) who like to brag tend to be vain, child-like and insecure. Their need to compensate for their deep-seated inadequacy, boost their ego and stand out from the crowd can make them do things which cross the line dividing acceptable and unacceptable behaviour. What are people who “big themselves up” such as Phil Hellmuth, Kanye West and Chris Moyles trying to hide? Even if they are only meant in jest, phrases like “Wow! That’s big!” only encourage sad, emotionally illiterate and immature people to play around even more. Modesty and shyness are far more appealing than vanity and brashness, aren’t they Vicky? To be fair to the Hendon Mob Forum, only a couple of posters would take malicious enjoyment from the double entendre, half a dozen more would join in, but in a more lighthearted and jocular manner and then the usual suspects would have leaped to your defence! Haha! That’s definitely an “After dinner” gem, Vicky. What sort of ad-man are they! The holy grail is an ad that will be a talking-point and that people will self-distribute to others who are also good targets for the ‘message’. Something tells me the original version would have been doing the rounds very rapidly! However, for the dignity of our heroine - good decision Vicky! Since he’s known as the “robin hood of poker”, I would like to hope that barry would have been wearing skin-tight green leggings in this imaginary scene of his. It would be perfect. Oh, and did you play the wsope or not? Didn’t see any mention on any online coverage, but I thought stars would have bunged you in one of those. corr….that’s a nice pair you have there…...!! I think you’re beautiful and intelligent and witty. I admire you in so many ways, Victoria Coren.